Well, sadly, we have reached the end of our summer. You may still have tomatoes on the vine in your garden though and you can turn them into a pot of this Creamy Roasted Tomato-Basil Soup. This is an infusion of textures; smooth and creamy with chunks of tomatoes and bits of fresh basil. It is our first-choice to kick off the fall soup season! 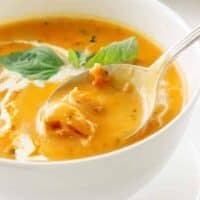 Creamy Roasted Tomato-Basil Soup with chunks of tomato. Fall, with those cool mornings and hazy, warm days! It is really and truly my favorite season and inspires me to soup-making. I grew up on tomato soup but of the canned variety. Mom fixed tomato soup pretty regularly. It was fast and a couple cans of it made a nourishing lunch for our clan. Mom would mix a can of soup with a can of milk, drop in a chunk of butter, (read that as margarine), and serve it piping hot! While it was heating she made grilled cheese sandwiches. We called them ‘toasted’ cheese sandwiches in my day and she made them with Velveeta cheese which we all loved! Comfort food and good memories. This creamy roasted tomato-basil soup tastes way different from what I remember of the canned variety. Actually, there is no comparison. Our creamy roasted tomato-basil soup is a savory blend of roasted fresh tomatoes, onions and garlic blended together with cream. 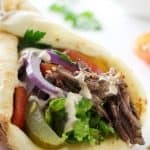 The texture is smooth and creamy but it still has chunks of tomatoes for extra texture. We finished it with a bunch of fresh basil bits which gives it a fresh, vibrant flavor. When you roast the tomatoes, the natural sugars caramelize and the tomato flavors concentrate and deepen. Roasted tomatoes just have more flavor and make some incredible tomato soup. 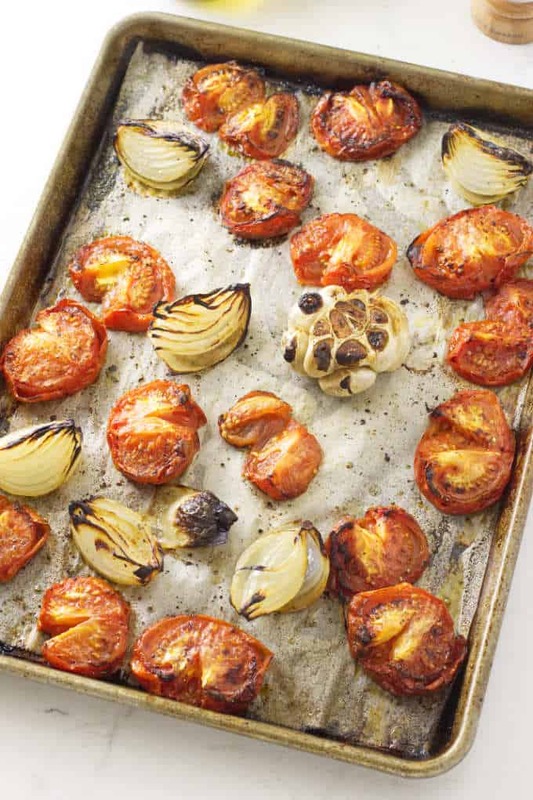 Roasting the tomatoes, along with the garlic and onions, might seem like an unnecessary extra step but it makes a world of difference. 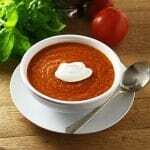 Basil is a classic flavor combination for tomatoes and adding it to this soup will put a little magic in your cooking. This soup is not anything close to the bland cans of tomato soup in the grocery store. 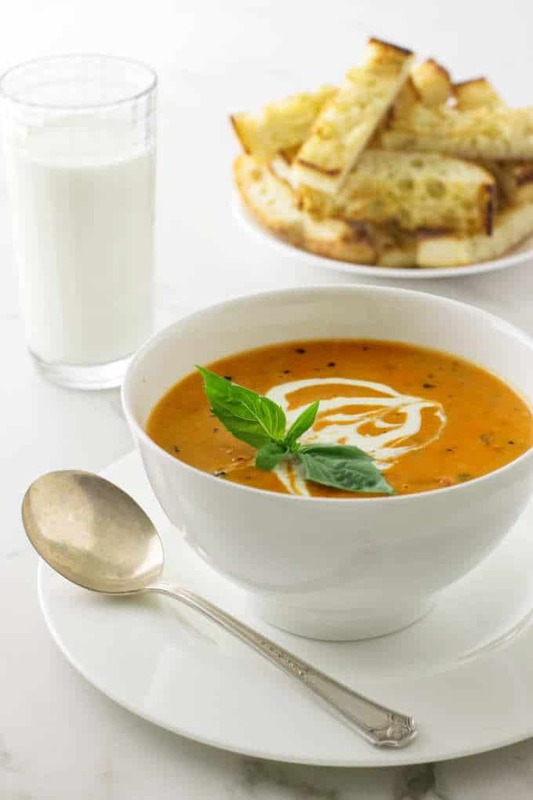 A bowl of hot, creamy roasted tomato-basil soup is just what we need on a cool fall day. 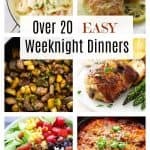 CAN I MAKE TOMATO SOUP WITH FRESH TOMATOES? Oh, yes, you can! Fresh tomatoes make insanely good soup. You don’t even have to roast the tomatoes in order to turn them into soup. But as we mentioned above, roasting them brings out their sweetness and enhances the flavors. 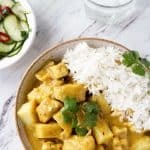 This is one of the easiest soups you can make! Tomatoes, Onions and Garlic….ready to roast. First, we removed the stem-core from the tomatoes, cut them in half and placed them on a parchment-lined baking sheet. Next, we cut two medium onions in quarters and trimmed the top off of one whole head of garlic and added them to the baking sheet. We drizzled olive oil over the vegetables and sprinkled them with salt and pepper then roasted them in a hot oven. Preparation will take you all of ten minutes! Did we mention this is easy? The vegetables roasted for forty minutes and we let them char a bit. We like the slightly smoky flavor of the charred vegetables. It brings something ‘extra’ to the soup. Next, we picked the garlic cloves from the garlic head and added all the roasted vegetables and the chicken broth to the pot of soup. Roasted tomatoes, onion and garlic. We stirred in three-ounces of canned tomato paste which deepened the tomato flavor even more. Next, we used our stick blender, also known as an immersion blender, and puréed everything into a thick, flavorful soup. Finally, we stirred in the chopped basil and a can of diced tomatoes to give the texture of our soup a little chunkiness. 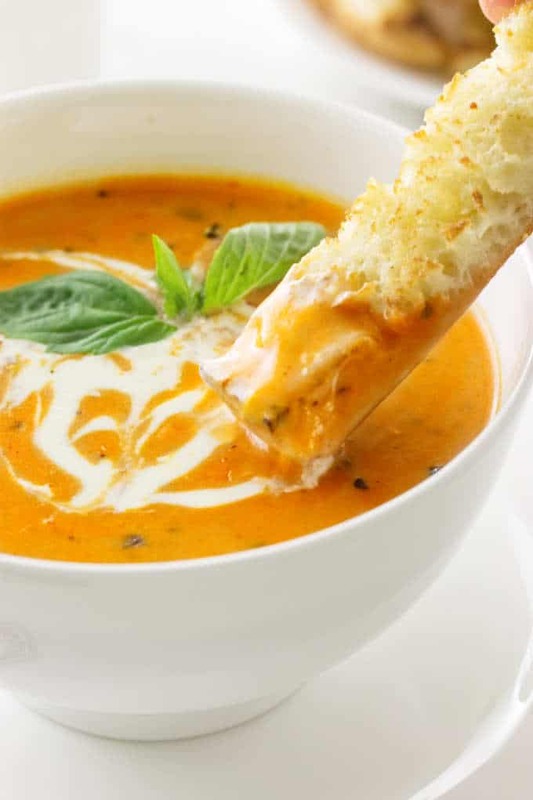 IS THERE SUGAR IN OUR CREAMY ROASTED TOMATO-BASIL SOUP? Tomatoes naturally have sugar in them and when you roast them, the sugars concentrate and caramelize. That natural sweetness gets enhanced even more with the addition of a little honey. Not only does the honey balance out the acidity of the tomatoes, but it also adds an extra layer of flavor. HOW DO YOU ADD CREAM TO TOMATO SOUP WITHOUT CURDLING IT. Because tomatoes are acidic, curdling can be an issue when you add the cream. Plus if you boil the soup after adding the cream, it will make the soup curdle. 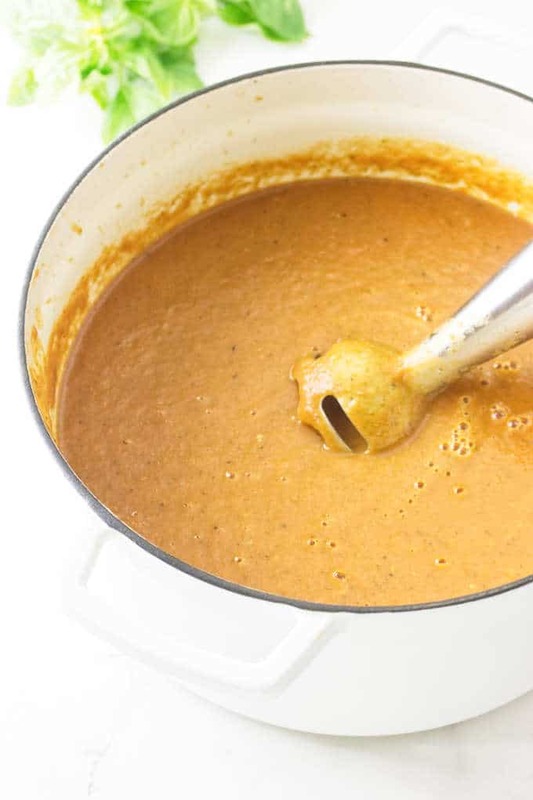 The soup will still be okay to eat if it curdles, but it won’t be as smooth and creamy. 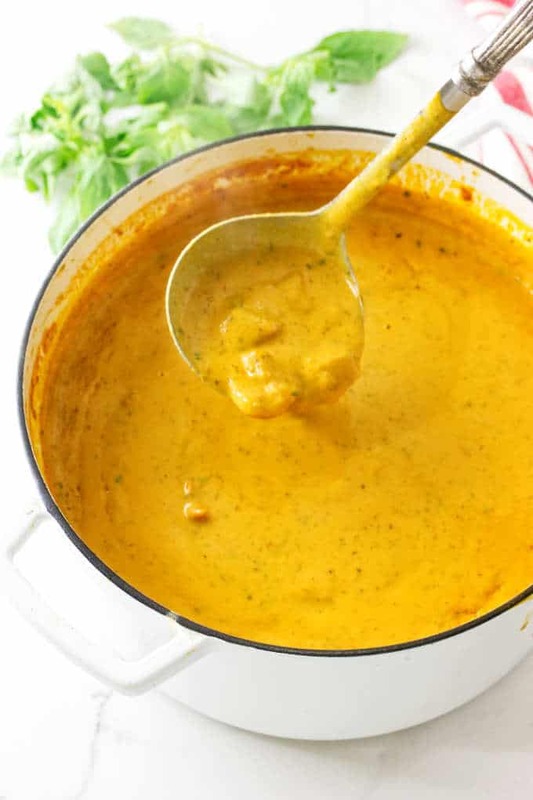 So here are some tips to help you add the cream to the soup without curdling it. Temper the cream. 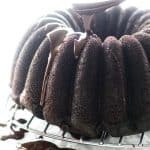 Tempering is when you slowly bring the temperature of one ingredient up to the same temperature of the second ingredient. In this case, the cold cream needs to warm up to the temperature of the hot soup slowly. The easy way to temper cream is to take a small amount of hot soup and add it to a dish with your cold cream, stirring constantly. We tempered the cream with half a cup of the hot soup before blending it into the whole pot. Then we returned the soup to the heat and set over low. We kept the soup just at or below simmering until it was ready to serve. Do not boil the soup after you add the tempered cream. Acidity and heat are the biggest culprits that cause milk products to curdle. Keep the heat turned down when it is time to add the cream. Use heavy cream. Fat protects the proteins in the milk from denaturing and curdling. If you use low fat or non-fat milk, you will be more likely to have it curdle on you. Tomato soup! Comfort food in a bowl. This soup will keep for several days in the refrigerator. When reheating, be sure to heat on medium-low or low until hot. Never, ever let it boil. CAN YOU FREEZE CREAMY ROASTED TOMATO-BASIL SOUP? Yes, this soup freezes very well. Pour into a freezable container with a lid and place in the freezer. Thaw completely before reheating. Reheat slowly over low heat. We do not recommend reheating the soup in the microwave as it will be reheating unevenly and prone to curdling. 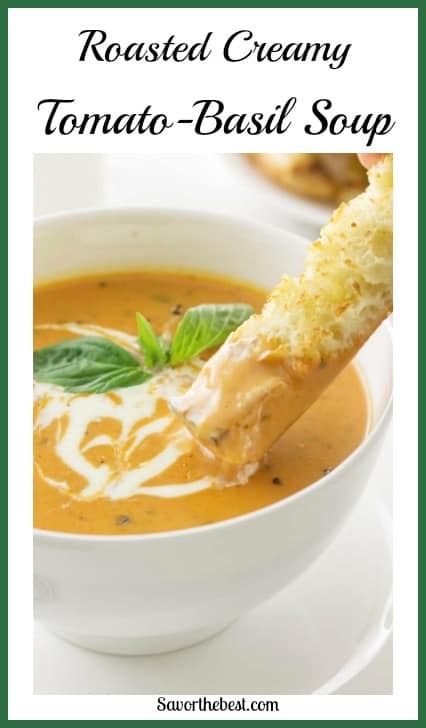 Each bowl of creamy roasted tomato-basil soup was garnished with a drizzle of heavy cream and a sprig of fresh basil. Slices of toasty sourdough bread that had been brushed with our garlic butter sauce was served with the soup for dipping. Yum! 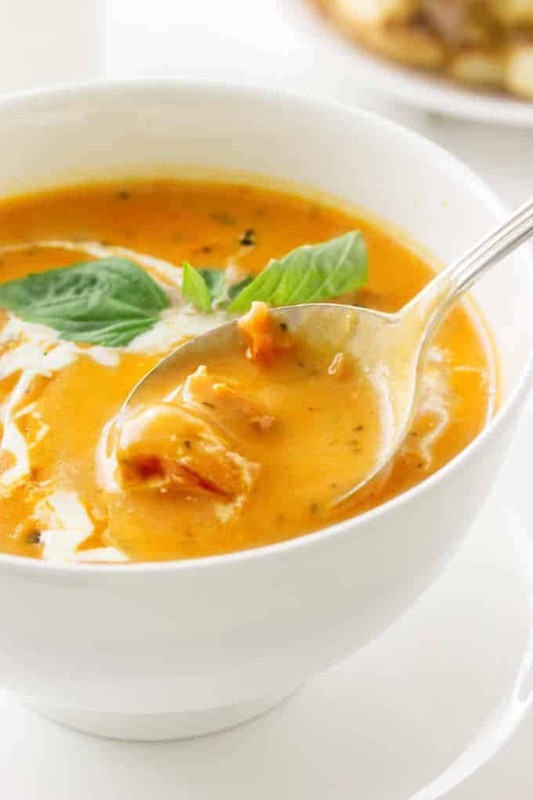 Creamy roasted tomato-basil soup is a savory soup of roasted fresh tomatoes, onions and garlic blended together with cream. The texture is smooth and creamy while having chunks of tomatoes and lots of fresh basil bits. 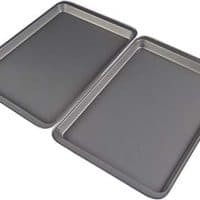 Preheat the oven to 425°F and line a baking sheet with parchment paper. 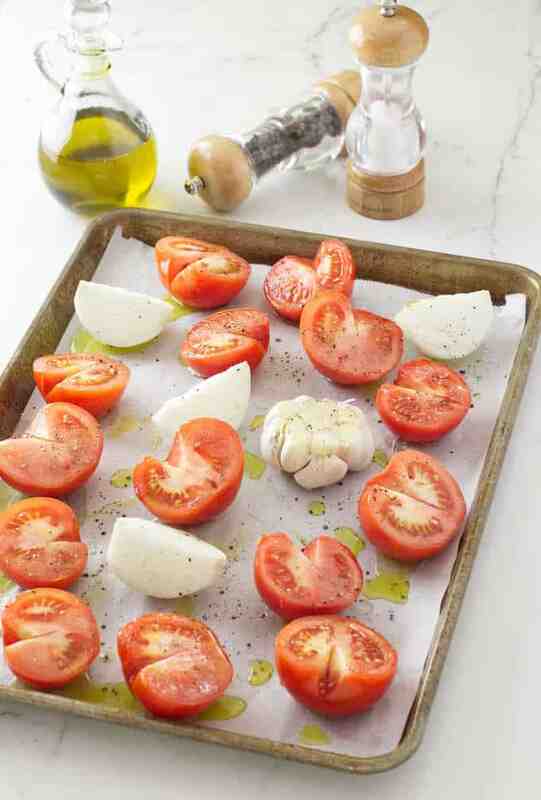 Place the tomatoes, onions and garlic on the baking sheet. Drizzle the vegetables with olive oil and sprinkle with salt and pepper. Transfer the baking sheet to the oven and roast for 35-40 minutes, a little charring is ok, it adds a nice smoky essence. When roasted, transfer to a workspace and cool. Remove the garlic and pick or squeeze out the roasted cloves onto the baking sheet. Transfer all the roasted vegetables to a Dutch oven or large soup pot set over medium heat. Add the chicken broth and stir in the tomato paste. Bring to a boil, reduce to low and simmer for 15 minutes. Remove from the heat and cool for 10-15 minutes. Using an immersion blender, puree the mixture until smooth. 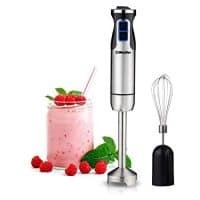 Or if you do not have an immersion blender, you can puree the vegetables, in batches, in a blender, then transfer the puree back into the cooking pot and stir in the diced tomatoes and the honey then season it with salt and pepper. Simmer the soup over low heat until hot. Temper the cream: Place the cream in a bowl and pour 1/2 cup of the hot soup into the cream while stirring constantly. Stir the tempered/warmed cream into the soup along with the chopped basil. Taste and adjust the seasoning. 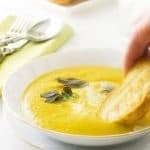 Ladle the soup into bowls, garnish with a drizzle of cream and fresh basil sprigs to each serving. Ripe, soft tomatoes are best for tomato soup. To ripen quickly, place in a paper bag with a banana for a day or so before making your soup. For easy clean-up, when roasting the vegetables, line a baking sheet with parchment paper. 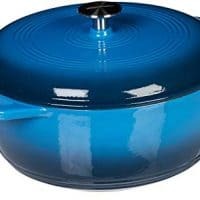 Use an enamel coated Dutch oven or stainless steel pot. Do not use a cast iron or aluminum pot as the acid in the tomatoes can react with metal. Tomato paste is a flavor-booster. It is thick and can be easily stirred into the soup by first mixing it in a dish with some of the hot tap water. An immersion/ stick blender is a wonderful tool. A blender can be substituted but the soup should be processed in batches. Process the batches with the blender container no more than 3/4 full.